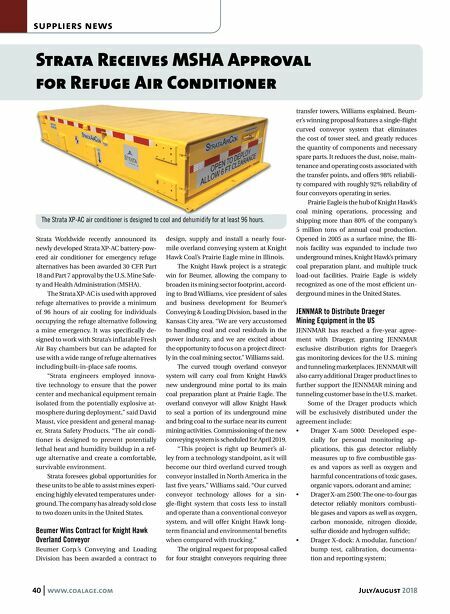 July/august 2018 www.coalage.com 41 suppliers news continued • Drager ChargeAir Systems: Allows di- rect refilling of compressed air cylin- ders on-site, even when while in use during tunneling or mining operations, allowing workers and emergency crews an uninterrupted supply of air; and • Drager MRC 5000 Mine Refuge Chamber: An essential element to any mine rescue plan, the high-quali- ty, underground emergency chamber that can protect mine workers in the event of contaminated air. "These products will enhance JEN- NMAR's sales and add to our presence in providing safety equipment to the min- ing and tunneling industries," said Tony Calandra, executive vice president of JEN- NMAR. "Draeger is a first-class organiza- tion with quality products." Managing the JENNMAR/Drager alliance and driving customer service and product enhancements will be Brad Rekuc, Draeger sales director, and Jim Pin- kley, JENNMAR vice president. "We are pleased to partner with a company like JENNMAR that so closely aligns with our organization's vision to make the mining industry more efficient, and more importantly, make the mining industry safer," Rekuc said. Mole-Master Introduces New Abrasive Blasting Brochure Mole-Master Services Corp., a leader in pro- viding silo cleanout services and products to a broad spectrum of industries, has a new four-page brochure describing the compa- ny's media blasting capabilities and services. The brochure begins by defining me- dia blasting, ice blasting and abrasive blasting. The brochure then delineates some of the numerous types of media that can be used for abrasive blasting. Some of these include walnut shells, Sodium Bicar- bonate (also referred to as soda blasting), steel shot, crushed corn cobs and more. Finally, the brochure offers a compre- hensive list of applications where media blasting can maximize efficiency and help save time and money. Whether the re- quirement is to remove mold or to clean out a silo completely, some form of media blasting can be utilized without damaging the structure or creating a difficult mess. "We are excited to have this piece in hand so that we can explain to our customers what our media blasting ser- vices include," said Dave Laing, general anager, Mole Master Ser- vices Corp. "We don't talk about media blasting as much as our other services, but this service is critical for many of our customers." 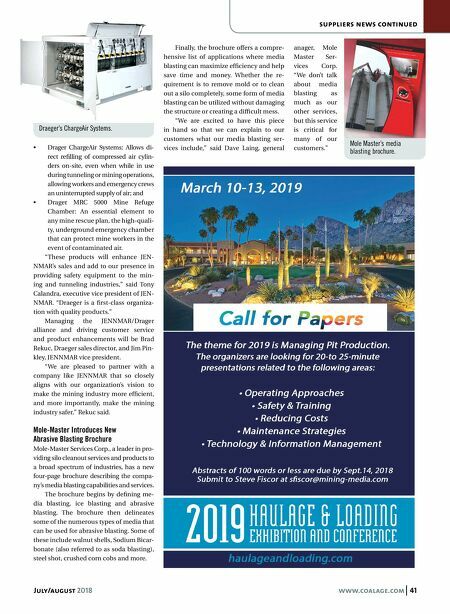 Draeger's ChargeAir Systems. Mole Master's media blasting brochure.